Mare Crisium is a big and round dark spot in the face of the Moon. It is easily visible through the naked eye on the right side (East) of the Moon. Inside Mare Crisium there are some interesting features, like small craters as Picard or Peirce. 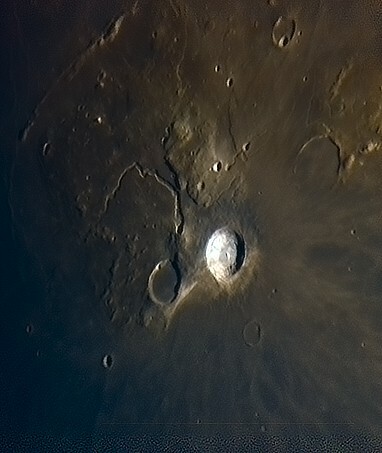 Proclus is the bright crater on the left (West) beyond the Crisium border. Some bright rays emerge from it crossing part of Mare Crisium. At north-east of Crisium (above right) there is a small and dark surface called Mare Anguis (the “serpent sea”). A big crater is visible at its left (West) known as crater Eimmart. This picture was taken as the integration of 30 subframes stacked in Registax 5, from a video made with Casio Exilim EX-Z80 afocal on Meade Lightbridge 16-inches big Dobsonian, with no tracking. Aristarchus is a rather peculiar crater. It is for me the most exciting pattern in the Moon. It is located over a weird squared area and there is an important valley near it, to its north-west. It is visible since now, 2 days before Full Moon. The picture was shot tonight through a non-motorized 150mm (6 inches) reflector using high definition video capture with Casio Exilim EX-FS10. Humboldt crater as seen with the Vixen 12×80 binoculars. This is a big crater but very near to the Moon limb. One day after full moon, Humboldt delivers high contrast images due to its shadow. The day this shot was made, the Moon libration wasn’t the better one to view Humboldt in its extension, but edge-on. The inner central peaks are visible.